After a long night dealing with Walmart, I was so thankful to get some sleep. Zach got up and left around 6ish and I went to the bathroom then went back to bed. I decided not to go to my ladies bible study because I needed the rest. At about 10 my phone rang and it was Zach. He was supposed to be in Waycross by 8 for his meeting and he said he wasn’t there yet. I got worried and then he told me what happened. He and this guy, Chip, car-pooled to the meeting and Chip drove his truck. Well I’m not good at retelling this kind of stuff since I wasn’t there but they were driving down some road and it split and they were going 65 and this guy wasn’t paying attention and turned left in front of them. They didn’t have time to stop and they had two choices, either go into this HUGE ditch or serve into oncoming traffic. Zach said Chip handled it really well. He hit his gas instead of his break and swirved around the guy but the guy still hit them and lost his headlight. This caused the truck to spin into the oncoming traffic and Zach said a HUGE semi was heading right towards them. Again Chip hit the gas and went into a much smaller ditch on the “wrong” side of the road. 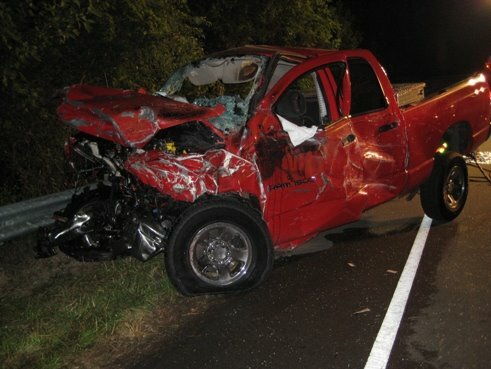 This isn’t his truck, Zach said it wasn’t as bad as this in the front but the side as about as bad. Zach said that the whole thing went in slow motion (I remember in my wreck with Mark in high school feeling that way too! I can even remember what we said during the wreck taking place) and that when that semi was heading towards him he just kept thinking about how he’d never get to meet his baby and that I’d be left all alone. I can’t imagine how scared he must have been! Thankfully neither of them were hurt. The guy that hit them took off though! Luckily a car behind him followed him and they caught him and arrested him! Pretty dramatic stuff!!! The whole thing is pretty ironic because since we got pregnant I’ve been so so so worried that something will happen to Zach. I think this is a normal feeling. Before I was pregnant we didn’t really have many responsibilities and if he died it’d be devasting but not as much as it would be now. Not only do I not know how I’d survive without him emotionally but also physically! We only have $10,000 in life insurance on him…that wouldn’t help much especially since I don’t work! It’s funny (not haha but again, the ironic kind) because JUST last week we met with Mr. Rusty (he does financial planning) about getting a bigger life policy, we wrote an online will, and Zach’s scheduled for the health check-up for the life policy next week! Wow that IS super scary. Jeez. You think you need Zach now, wait until Clover is here, you have no idea!